The start to Kevin Padlo's season did not go as planned. After a breakout rookie campaign following his fifth-round selection last June, he was assigned to Class A Asheville, where he was the seventh-youngest player in the South Atlantic League. Now, part of a core group of players with whom he's comfortable, Padlo's finding himself again. The Rockies' No. 14 prospect homered, doubled twice and drove in a career-high six runs Friday night as Class A Short Season Boise rallied late for an 11-10 triumph at Everett. Only 18, Padlo batted .145/.273/.277 in 27 games at the Class A level in an aggressive Opening Day assignment. The Rockies weren't worried, lifting him from full-season action and sending him back to extended spring training to wait for the start of the Northwest League season. Back in Arizona, he rediscovered himself. "It's been good, especially because I have a bunch of buddies on this team," he said after Friday's win. "Just getting back to baseball and having fun with it, it's been really fun. "Guys like Max George and Terry McClure and all them, it's fun joking around with them. They always keep me on my toes, just always loose and relaxed. And you're always at your best when you're like that." In a comfortable setting, Padlo put up his best game of the year against the AquaSox. The right-handed hitter blasted a three-run homer to left field in the first inning to get the Hawks going. "[Everett starter Lane Ratliff] threw me a curveball first pitch down in the dirt and I took it. Then he threw me a fastball in, so I had a 2-0 count," Padlo said. "I knew he didn't want to put me on base, but in the back of my mind there was an open base still. I knew he might not come to me, but he left one right middle in. Just turned on it. "It's been a while since live game action when I got one of those. It felt good to touch hands with the third base coach again." 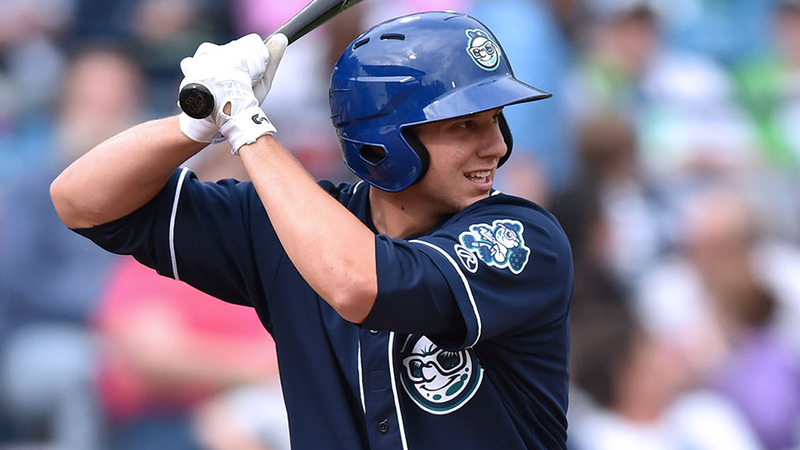 After his first homer since April 24 with Asheville, Padlo doubled to right to drive in a run in the fourth and brought in two more with a double to center in the eighth. "It's just been relaxed more, just see the ball and hit the ball, no pressure on me and all that kind of stuff," he said. "Along with getting some good pitches tonight, of course, and guys being in the right spots at the right time, being on base, I saw the ball really well tonight." With his struggles in Asheville behind him, Padlo has gained perspective on his mid-May reassignment. "I was a little bummed at first," he said. "Obviously, I wanted to stick up there the whole season, but in the end, I think it was the right move. I was frustrated every day going 0-for, not squaring the ball up. To get back there in extended [spring training] with the coaches from last year, a bunch of buddies from last year just telling me to relax, these games don't matter, get your swing back. All that stuff really helped me out." Boise's roster is comprised of a host of players with whom Padlo spent last season at Rookie-level Grand Junction. "The 0-fors add up," he said. "You're sitting there, beating yourself up. Everybody else is getting hits, having a good time and you're just sitting there beating yourself up. To come back here and be with these guys, have fun with the game again has really helped out." The Hawks surrendered two-run leads in the seventh and eighth, but 2015 22nd-round pick Eric Toole put them back in front for good with an RBI double in the ninth. "It was good to see from our rookie outfielder out there to get that double off the wall in the top of the ninth," Padlo said. "I was pumped for him. I was giving him all kinds of congratulations. It was good to see the bats wake up." Every member of Boise's lineup had at least one hit, except catcher Hamlet Marte, who went 0-for-2 with three walks. George matched Padlo with three hits.